This combination of Oct. 14, 2016, file booking photos provided by the Sedgwick County Sheriff's Office in Wichita, Kan., shows from left, Patrick Stein, Curtis Allen and Gavin Wright, three members of a Kansas militia group who were charged with plotting to bomb an apartment building filled with Somali immigrants in Garden City, Kan. 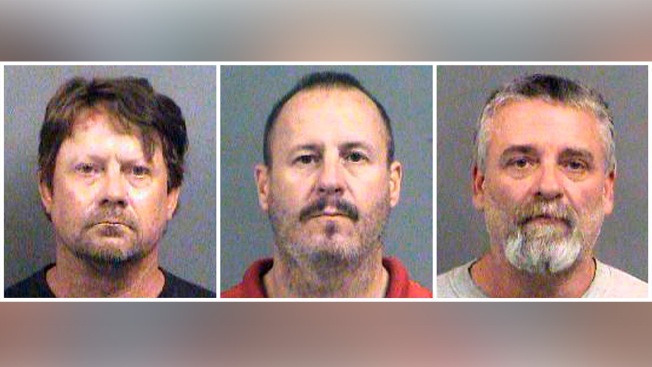 The three militia men could face life in prison for a foiled plot to blow up a mosque and apartments housing Somali immigrants in Kansas. A federal judge will sentence Stein, Wright and Allen on Friday, Jan. 25, 2019. Three militia members convicted of taking part in a foiled plot to massacre Muslims in southwest Kansas were sentenced Friday to decades in prison during an emotional court hearing in which one of the targeted victims pleaded: "Please don't hate us."